Manchester United could reportedly soon be facing fresh transfer interest in goalkeeper David de Gea from Real Madrid under returning manager Zinedine Zidane. According to the Daily Mirror, the French tactician is unconvinced by Thibaut Courtois as Los Blancos no.1, having dropped the Belgian for Keylor Navas in his first game back in charge of the club this weekend. Courtois has not looked at his best since joining Madrid from Chelsea, and it seems fairly clear De Gea would be an upgrade. The Spain international’s contract situation at Old Trafford will also make this development a big worry for United, as his deal will expire at the end of next season after a one-year option to extend it was triggered, as noted by the Mirror. The report states news of Real’s interest will ‘spook’ the Red Devils, as the Spanish giants supposedly set aside around £75million to try to sign De Gea. 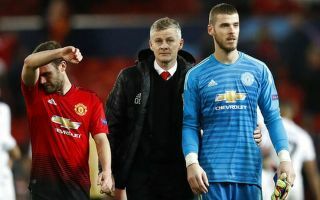 Man Utd fans will have hoped that Courtois’ move to the Bernabeu this season would have ended any De Gea Real Madrid speculation, but it seems that won’t be the case. Ole Gunnar Solskjaer could really have done without this as he possibly prepares to become the next full time United manager.